Carriage Cleaners is an active dry cleaning business located in the Town of Brighton in Monroe County, New York. The site is located on a 0.35-acre commercially zoned parcel on the corner of Monroe Avenue and Brooklawn Drive, surrounded by a densely populated area of residential and commercial structures. The Site has been operated as dry cleaners for more than 25 years, with Carriage Cleaners operating the last 15. It is adjacent to a petroleum spill (Spill #0306131) which occurred at the Former Newcomb Oil/Citgo Gasoline Station located at 2087 Monroe Avenue and within approximately 300 feet of a Class 2 Inactive Hazardous Waste Disposal Site (HW ID No. 8-28-128) identified as the Former Speedy’s Cleaners site at 2150 Monroe Avenue. 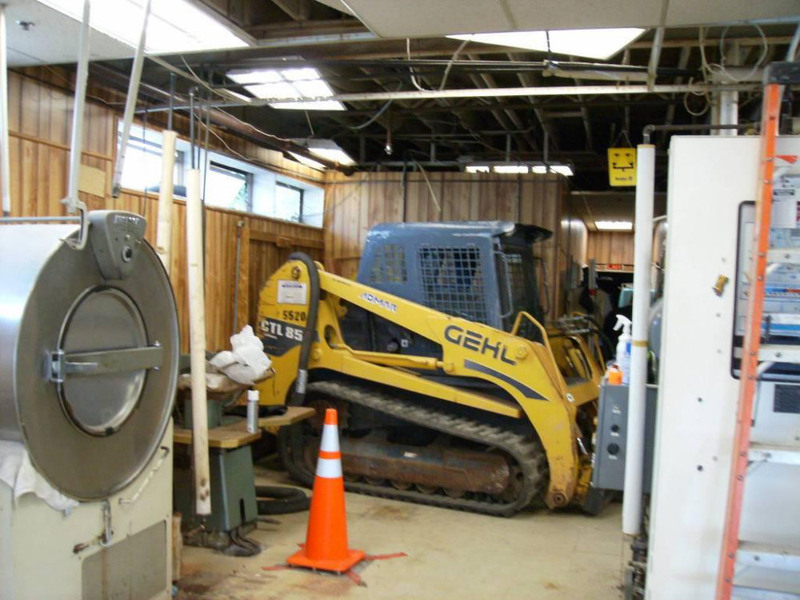 The main contamination was perchloroethene (PCE), a dry cleaning chemical that was released from a damaged sewer line. Carriage Cleaners remained open for business throughout the project. NRC was called upon to remediate a PCE spill from the soil surrounding the broken sewer line as well as install a soil vapor and groundwater extraction (SVE/GWET) system to treat PCE that had spread beyond the immediate spill area. 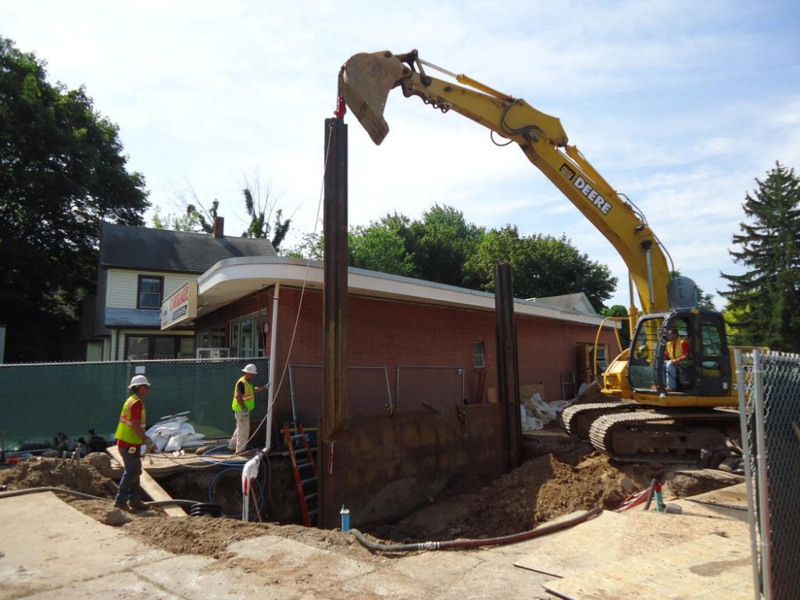 Approximately 200 tons of non-hazardous soil was excavated around the existing sewer pipe and a temporary bypass sewer line was installed during excavation. A structural shoring system was utilized to support excavation activities. Vibration monitoring was conducted throughout the excavation work to ensure there was no adverse effect to the building or surrounding structures. The excavated area was treated with a potassium permanganate compound to oxidize any organic contaminants and an injection treatment system was installed. In addition, five Soil Vapor Extraction (SVE) and four vacuum monitoring points/injection wells were installed inside the Carriage Cleaners building. An existing groundwater extraction well was modified to connect to the trailer where the SVE/GWET system is housed. NRC also performed sampling and monitoring of the SVE/GWET to confirm effectiveness. PCE contamination from leaked drainage pipe. 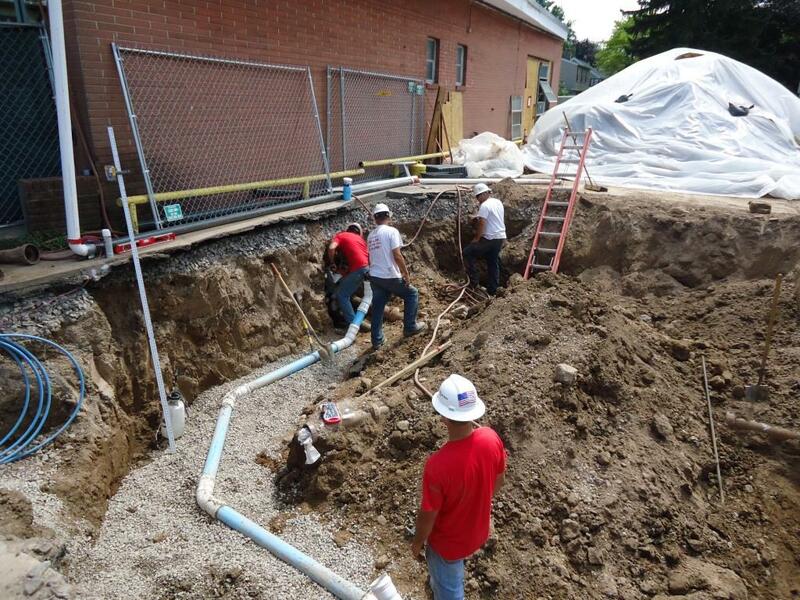 Installation of Soil Vapor and Groundwater Extraction (SV/GWET) System. Surgical Excavation of over 200 tons of soil using Structural Shoring System for support. Installation of 5 SVEs and 4 Monitoring Wells. Sampling and Monitoring of SVE/GWET.